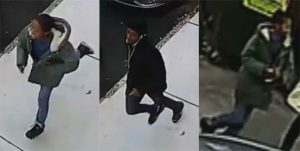 Males wanted for robbery in North Philly. Male, was walking on the 1400 block of west Jefferson Street at Carlisle Street when a group of juvenile black males ran up behind him and suspect #2 attempted to knock his headphones off. When the victim ran on Jefferson Street, he was chased by the group who then caught up to him and began assaulting him. After the victim threw his headphones to the ground, one of the suspects picked up the headphones, and the group fled and were last seen west on Jefferson Street. Suspect Description: Suspect #1: Black male, 10 years-of-age, 5’0″, thin build, wearing a green coat, and blue jeans. Suspect #2: Black male, 17 years-of-age, 5’10”, thin build, wearing a black coat, black hat, and dark colored pants. Suspect #3: Black male. 16 years-of-age, medium build, wearing a dark colored coat, burgundy hooded sweatshirt, and dark colored pants.